We have written at length about Germany’s lack of venture capital. 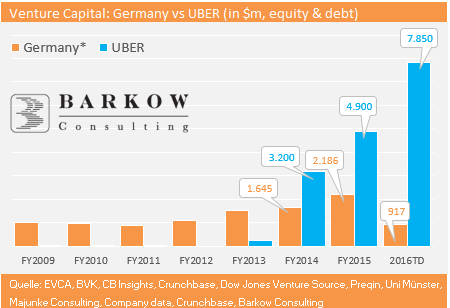 In a recent note we quantified Germany’s VC gap versus the US at €9bn reaching yet another post crisis record high. Of course, there are manifold reasons for Germany’s lack of Venture Capital. A main factor in our view is, however, the acceleration of mega VC (≥$50m) and private IPO (≥$100m) rounds in the US. 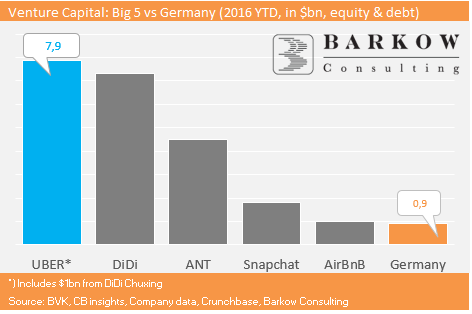 While we observed surprisingly many mega VC rounds in Germany, we are still operating on a comparatively low base. Germany had 7 private IPOs in 2015 giving it a 3% global share. In H1 2016, however, there was only ONE leading Germany’s global share down to only 1%. Another more recent trend is the the appearance of UBER-private-IPO rounds of $1bn and above. 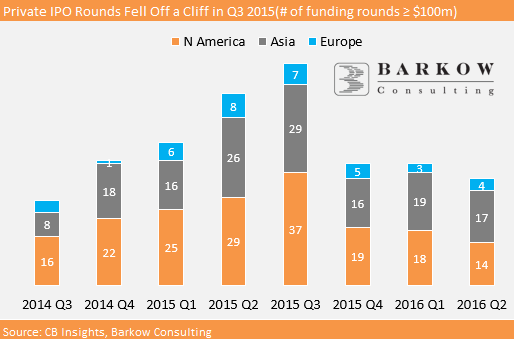 These UBER-rounds have compensated for the global drop in private IPOs since Q3 2015. In the US “only” 14 private IPO rounds have reached a record share of 39% of all VC dollars spend in Q2 2016 according to the NVCA and PwC. Another way to show how important large private IPO funding rounds have become is to look at one specific company: UBER. UBER is probably the best funded tech startup globally although chinese firms such as ANT Financial and DiDi Chuxing are nappling on its heels already.